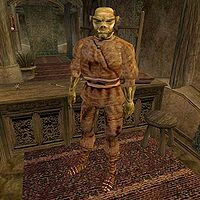 Garothmuk gro-Muzgub is an Orc smith who has a shop in Suran. He is very knowledgeable about armor and weapon types, and has a decent selection of them available for sale, as well as offering repair services. There is some Orcish armor behind the counter, his private collection. A skill book for Light Armor, Ice and Chiton, is on a table upstairs. This page was last modified on 2 February 2016, at 23:13.